Jacob Gottlieb is joining forces with a former teammate and mentor. He and Stuart Weisbrod were very successful together as Healthcare investors. The two men initially met at Merlin Biomed Group. Weisbrod was a high-ranking member of the organization while Gottlieb was a portfolio manager for Stuart. Weisbrod had a high level of expertise that shaped the way Gottlieb would view the business from that point forward. Jacob Gottlieb went on to do great work for Merlin, helping the company achieve great returns in 1999 and 2000. He assisted with bringing in key clients up until the company closed for business in 2007. Jacob Gottlieb went on to have success in the finance industry. He launched his own company called Visium Asset Management with a 300 million dollar investment. Gottlieb quickly pushed the company’s value to 2.5 billion dollars. He survived the financial crisis in 2008 and led Visium on a path of continued success. The organization eventually grew into an 8 billion dollar hedge fund. Visium has over 200 employees with offices in cities around the world including London, New York and San Francisco. Visium was a shining example of success for roughly 10 years. The company fell on hard times in 2016 when three of its executives were accused of insider trading. They were thoroughly investigated and reported to the FBI by a whistle-blower working on the inside. The authorities took time to mount all of the evidence and eventually brought charges against several employees at Visium. Jacob Gottlieb was never charged with any crime or ethical wrongdoing. He remains with the company as its CEO and has worked to return funds to its investors. Gottlieb is in place to wind down the company while it is being watched over by the SEC. Jacob Gottlieb has moved forward in his career and formed a new enterprise called Altium Capital. Altium Capital is a hedge fund that will be Gottlieb’s latest statement. The company already holds great value due to Gottlieb’s previous success in the industry. It has recently made a stake investment in Oramed Pharmaceuticals Inc. The Fortress Investment Group was established back in 1998 by a team of finance professionals looking to make a difference in asset management. Randal Nardone was one of them and has served in the management team for all these years. In the close of 2006, he joined the board of directors. He has acted in the capacity of the Chief Executive Officer for five years now having assumed office in August 2013. He has enjoyed an impressive career at FIG that has caught the eye of anyone who cared to look. Randal Nardone has overseen the establishment of numerous offshoots. The Fortress Credit Corporation, the Fortress Registered Investment Trust and the Fortress Investment Fund IV and V were all brought to life under his watch. He serves as the chief executive of most of them. Randal Nardone has gained great expertise during his time with FIG and has not shied away from offering the same to other institutions. This has afforded him the opportunity to serve on numerous boards. RIC Coinvestment Fund, Newcastle Investment Corp., IMPAC Commercial Holdings and Blackrock Financial Management have all enjoyed his services. He has held the position of CEO and director in most of these firms. At the moment he serves as a director of Springleaf REIT, Eurocastle Investment Limited, Springleaf Finance as well as Florida East Coast Holdings Corp. He is the president at Springleaf Financial Holdings and a principal at Fortress Credit Corporation. He attended the University of Connecticut where he studied Biology and English for his undergraduate degree. He later joined the Boston University School of Law and graduated with a J.D. Randal Nardone brought in a great wealth of experience to FIG from his previous positions. He began his career at the Thacher Proffitt & Wood law firm. His diligence and great work ethic saw him elevated to partner. When he eventually left the firm, he was serving in its executive committee. He later joined BlackRock and served as its principal. A year before going out on his own he became the managing director of UBS. 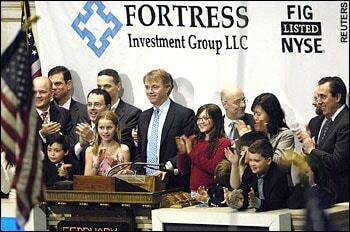 He stepped down in May 1998 and joined hands with Wes Edens and Rob Kauffman to bring the Fortress Investment Group to life. Despite being ranked among the top advertising executives, Lori Senecal walked away from her role as Global CEO of CP+B at the end of 2017. When she came on board with the company, her role was to bring management and organizational skills. Upon entry she and the CP&B chairman, Chuck Porter, planned for her 2018 exit. Her two years at the helm of CP+B were extremely successful and the organization has not lost a client since her arrival. Before moving to a professional capacity, Lori Senecal earned a bachelor’s of commerce in marketing and finance from McGill University. After McGill she worked for MDC Partner Network, Kirshenbaum Bond & Partners, and McCann Worldgroup in roles ranging from the Head of Sales and Marketing to CEO. At CP+B she served as Global CEO, expanding the organization’s reach through innovation and inventive management. In her interview with Inspirery, Senecal credits her success with a desire to help others be successful. She says simply “I make money when other people make money.” Truly a team player, she claims her skills are purely motivational. A “collective mission” and the “relentless passion” of those around her helped her get to where she is today. This strength is also Senecal’s weakness as she states her hardest decisions are made when teammates are not meeting the standard. Her desire for others to succeed sometimes impede her ability to speak candidly with them about their performance. You can visit interview.net for more. This selflessness aided her throughout her career in advertising and even as she left CP+B she said of her replacement CEO, Danielle Aldrich, “she [is] always looking to uncover the toughest business challenges… she’s a truly fantastic partner and friend, and the agency is smarter and more effective thanks to her leadership.” The advertising world, and CP+B specifically, will miss Lori Senecal, but her legacy lives on through those she worked with, learned from, and mentored. She recently spoke at 3% conference.